You'll be so close to the water, if you were any closer, you'd get wet. Sit out on the huge deck, large enough for everybody to enjoy the view. Enjoy the ocean, and watch the dolphins swim by. Have your morning coffee while watching the sun rise over the ocean and pelicans diving for their breakfast. Stroll this quiet section of beach looking for sharks teeth and seashells. This three level Town Home has it all. It offers you four bedrooms, 4 full baths, and is easily large enough to accommodate 12 people. Your whole family will have room to stretch out with wondrous ocean views everywhere. The main level has an open floor plan with the kitchen, sitting area, dining area, and living room all open with floor to ceiling glass windows overlooking the ocean. The kitchen is fully equipped with granite counter tops, tile backsplash, stainless appliances, a double oven, and tile floors. The dining area easily seats eight plus four more at the kitchen counter. Just off the kitchen is a sitting area and wet bar. Your living room is spacious enough for everyone and has a 75" TV. With a wall of windows facing the ocean you'll feel like you're on a ship sailing the seven seas. Walk out onto your deck and feel the warm seabreeze on your face. There is also a bedroom and full bath on the main floor as well as the laundry room with full size, high end washer and dryer. Located on the top floor is your master suite and second bedroom with a full bathroom. The master suite has a king size bed, an ocean view, and a private balcony where you can sit out and see the beach for miles. The master bathroom is all tile with a large walk in shower. The second bedroom also has a king size bed and a full bathroom just off the hall. On the lower level is a bedroom with a queen size bed, a full bathroom, and a large kids room/bonus room. The kids will love the two sets of bunk beds, couch, love seat, and large flat screen screen TV. It is the perfect kid's getaway. We supply basic cleaning and paper products for your stay. There's parking for four vehicles. At this retreat, you have free access to three outdoor pools and a fully equipped Rec Center with tennis courts, basketball court, shuffleboard court, playground, exercise room, indoor pool, sauna, and spa. Activities close by include: the Kure Beach Pier, the Carolina Beach boardwalk, the NC Aquarium, the Fort Fisher Civil War museum, or hop the ferry and stroll around Southport. Kure Beach has a skate board park and a disc golf course. The town park also has a new playground, tennis courts, and soccer field. You are 35 minutes from ILM airport and 30 minutes from downtown Wilmington. We have a selection of books, games, puzzles, DVDs, and videos for the entire family. We visit our property multiple times throughout the year and perform detailed cleaning, maintenance, and upgrades. 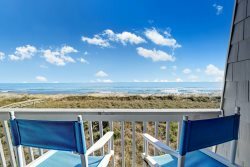 This is one of the nicest oceanfront, four bedroom Town Homes you will find in Kure Beach. This is our home away from home and you get to enjoy the benefits too. Stay here once and you won't want to stay anywhere else in the area. The location was amazing, directly on beach, and the house was spacious and comfortable The beds were comfortable, the deck was amazing. When it wasn't raining you could sit on the deck there forever watching the surfers and listening to the crashing waves. The house was gorgeous and comfortable. Very relaxing. Easy, just a few emails. Loved the roominess. Loved the windows facing the ocean. Loved the huge deck. Loved the wet bar area. Washer and dryer were new! Kids loved the room on lower floor all to themselves. Loved that we had pools nearby to use as well as hot tub and tennis courts Kitchen was well stocked. The folks at A1 were great. We had no problems. The property was fantastic. Right on the beach. The condo was large and spacious and decorated nicely with very comfortable furniture. We had 8 adults and it accommodated us all very well. Kitchen was nicely stocked with all the right appliances, plates, wine glasses, cooking utensils, etc. The A1 Property Management team was great! You responded to all emails quickly and answered all questions thoroughly. You even sent an email telling us fun things to do in the area which was helped us plan a wonderful and relaxing vacation. Loved the beach-front house! It was very roomy and easily accommodated members of our three combined families! Children enjoyed their separate bedroom and play area. From the parking area, you wouldnt expect much, but once in the door, this home blows you away! After several years of vacation in Carolina and Kure beaches, we were fortunate to find this gem. From the massive living areas to the bedrooms, this house gave us every luxury we could hope for. Lets not forget the oceanfront decks that gave us perfect views of the ocean, dolphins and sunrises! Great location at the southern end of the island, but close enough to get to restaurants, grocery stores and other activities in just a few minutes. The biggest surprise was the well supplied kitchen. If youre like our family that likes to dine in rather than out, youll find every top-of-line appliance and kitchen utensil needed to prepare a feast! Even with a large extended family here for vacation, we never felt cramped or wanting for anything more out of this house. The only issue, which has nothing to do with this home, is that the unusually high tides during our trip really reduced the amount of available beach during some times of the day. Otherwise, youre out of the house and on the beach in a few seconds! There are so many other things about this house that made it a near perfect vacation for our family. With no hesitation, wed recommend this to anyone looking for a great vacation rental. Great! They were very helpful and attentive. Everything! The property, decor, and location were absolutely beautiful! The kitchen was well-equipped and the unit was spacious enough to not only fit our group of 11, but provide us each with plenty of comfortable space for our weeklong stay! We loved having the separate space for the kids downstairs! We also liked the spacious living room upstairs and the large dining table. The dining table and chairs on the deck provided the ideal spot for adults to eat dinner together. Beautiful views!